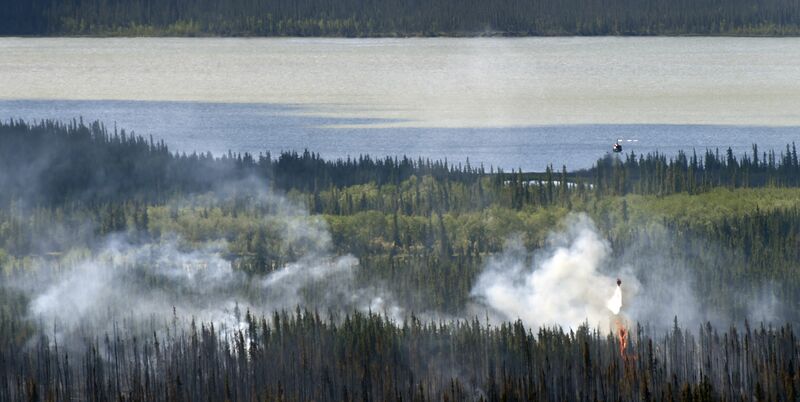 The 818-acre Tetlin River Fire south of Tok is now 25 percent contained and crews continued to increase mop-up depth around the fire on Thursday, according to the Alaska Division of Forestry. Firefighters succeeded in getting a hose line put in around the entire fire perimeter and are pumping water from nearby lakes, ponds and streams to douse any hotspots that are found. Crews continued to focus on removal of hazard trees along the Tetlin River corridor to facilitate navigation for firefighters and local residents in boats. Crews are also removing hazard trees along a main trail used by local residents during the winter. There are a total of 334 personnel working on the fire as of Thursday, including 10 Alaska hand crews that are camped out around the perimeter of the fire cutting saw line and gridding for hotspots. Conditions remain hot and dry in the Tok area, with similar conditions forecast for the next two days. The fire has received no measurable precipitation since it started on June 17. There are still pockets of unburned fuel in the interior of the fire that produce isolated tree torching and occasional columns of smoke are visible from the village. Fire managers are working closely with the Tetlin Tribal Council to keep village leaders apprised of the work that is being done and to ensure they are addressing any concerns villagers may have in regard to the fire. Tetlin Tribal Council Chief Michael Sam was scheduled to get an aerial tour of the fire on Thursday to see the extent of the fire around the village and the work that has been done by firefighters.A community meeting is scheduled for 7 p.m. today in Tetlin.